This past weekend was the Long Beach Expo, so I decided to head out there on Saturday to check things out. I received a free admission ticket due to my PSA Collectors Universe Set Registry membership. (I know I haven't spoken about this in the past, but I've been slowly putting together a completely graded, PSA 7 or better, 1961 Fleer set) I wasn't planning on purchasing anything this afternoon, but I ended up walking away with a handful of vintage cards. Unfortunately, I haven't scanned them yet, so pics are not included in this post. I'll scan them later tonight and post them up tomorrow. Of special note, there were several notable autograph guest slated to appear. So, going to the show had the extra benefit of seeing some stars. On the left below is a peek at Jerry West, to the right is Magic Johnson, and below them was Darryl Strawberry. The Straw-Man was not there as an autograph guestt. I didn't see him sign for anyone, but I also didn't hang around long enough to find out. Click on any pic to embiggen. Another reason to go to this show was to see 7 different T206 Honus Wagner cards all at one place. The Wagner in the Black bordered lucite case was graded at a PSA 5 and will be on auction soon. The attractive sales model speculated that it would sell for over a million dollars, and could come close to the record setting price sold for the PSA 8 Wagner (approximately at the low $2Million mark). She went to say that the PSA 8 Wagner is likely worth over $8Million. Personally, I think that's just a bunch of sales talk, but considering the mystic and controversy of that card, my jaw wouldn't drop if it sold for that much. 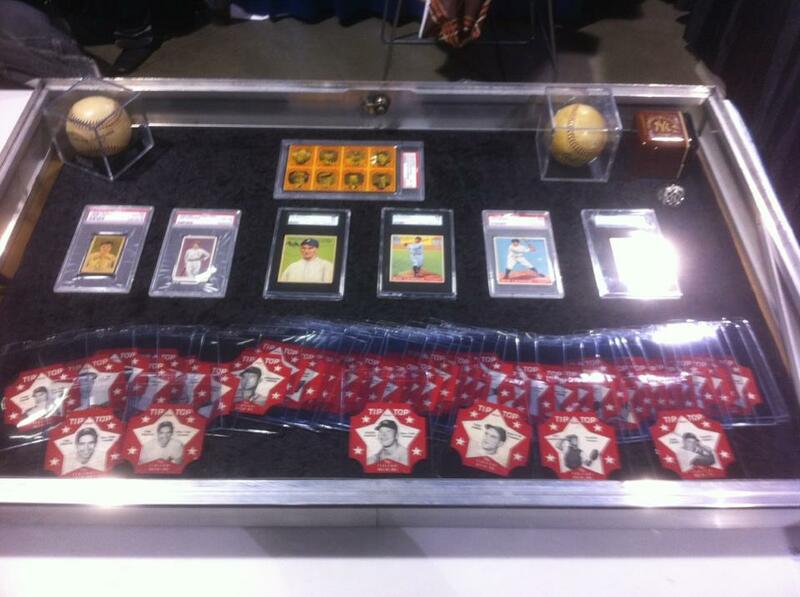 Since the Long Beach Expo is more known for being a gathering place for coin, stamp and currency collectors there were some great non-sports related memorabilia on display. For instance, check out a Peace Medal Exhibit below. I also chatted a bit with someone from Legendary Auctions. They had a small display near the autograph area. Below are some photos I look of what they had to show. Of note is the small pin on the left side, below. It is a 1915 PM1 pin purported to be of Babe Ruth, and is the only example of him known to exist. On the right side, below, is an early 1910's Ty Cobb Tobacco Tin. Only a dozen are thought to exist today. On the left is a 1912 S81 Turkish Trophies Large Silk Premium of Ty Cobb, and on the right is a 1951 Stan Musial game-used road jersey. I also stopped by the Goldin Auctions table to take a closer look at the Tip Top Bread Labels near-set (at the very bottom below- red bordered). It is missing just one card, and includes all known variations. The Roy Campanella and Duke Snider labels are at the very bottom right. These are extremely rare to find in any condition. Above the labels are various key vintage cards; (from left to right) like a Babe Ruth strip card, a 1909 E90-1 Joe Jackson rookie card, a 1933 Goudey Napoleon Lajoie, a 1933 Goudey Babe Ruth, and 1933 Goudey Lou Gehrig. The card at the very top is a Exhibit card with Babe Ruth. 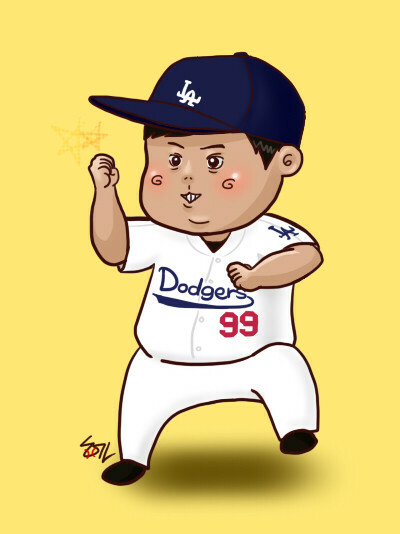 Above is an amazingly cute drawing of Hyun-Jin Ryu, via MyKBO on twitter. Ya know what, cute and Baseball should never mingle. The fan who drew it has her own website filled with Korean Baseball cuteness. Check it out here. Bob Lemke tells us about the first time Pee Wee Reese was thrown out of a game. It's a great story. Steve Dilbeck of the LA Times wonders if this is the year for a Dodgers - Angels World Series. Uber Dodger fan Alyssa Milano shares a family moment on her MLB Blog. In the video she takes a swing with a mini bat as little Milo looks on. He adorably screams, "goal, baby!" It's great that the Dodgers contributed some award money for the capture of that fugitive former cop (via Dayn Perry at CBS), but what the heck is up with police officers shooting innocent people in their chase to find him? In every case of mistaken identity, not one person looks anything like the guy they are looking for- not even close. Do folks who drive a dark colored pick-up truck need to worry about being shot at by the police? Look, I know their job is tough, but don't these recent actions denote that a bigger problem is afoot? Joe Lucia at the Outside Corner reviews each team's offseason. Topps is bringing back the Turkey Red brand, and it will be a online exclusive- meaning that collectors will only be able to purchase packs at the Topps website, here. Pre-Sale begins tomorrow. Clayton Kershaw, Andre Ethier, Matt Kemp, Hanley Ramirez, Adrian Gonzalez and Zack Greinke are in the 100 card set. Deliveries begin on the 18th of this month. Tara Copeland at Arta takes a behind the scenes look at the Ebony photo shoot featuring Matt Kemp and his mother. Mark Townsend at Big League Stew tells us about the sad state of affairs with the Miami Marlins. MLB should kick that owner out of Baseball. Jeffrey Loria must go! Sports betting to be legal in California? There's a bill in the California legislature to do just that, via Sports Business Digest. 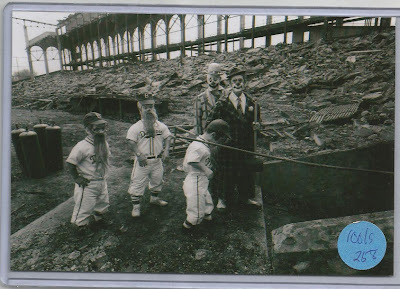 Following up on an auction item I featured last week, I bring to you another eBay item featuring a torn-up Ebbets Field. Like in the previous photo, the demolished remnants of the old borough park still remains. The skeleton of the old facade is the last thing standing, while piles of debris litters the field and grandstands. In the foreground, several men can be seen 'clowning' around. One hilariously costumed gentlemen carries around a large mallet, as if prepared to knock the place down himself. Three other bearded little people, dressed as the Dodgers version of Eddie Gaedel, try to quietly scamper down the stairs. The look of dejection is clearly on their faces. Although they are clowns meant to put a smile on your face, you can't help but notice the sadness in their eyes. The above photo negative recently sold on eBay at $58.00.